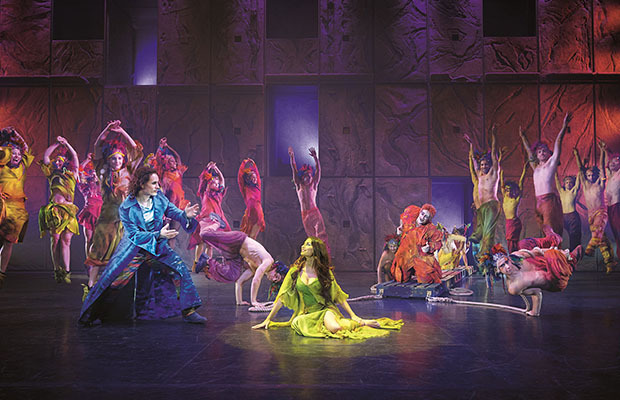 Luc Plamondon and Richard Cocciante’s Notre Dame de Paris was last seen in London back in 2000, when an English translation ran at the Dominion Theatre. It’s now back in the West End for a limited run at the Coliseum, this time performed in the original French, as part of an ongoing international tour to celebrate the show’s 20th anniversary. 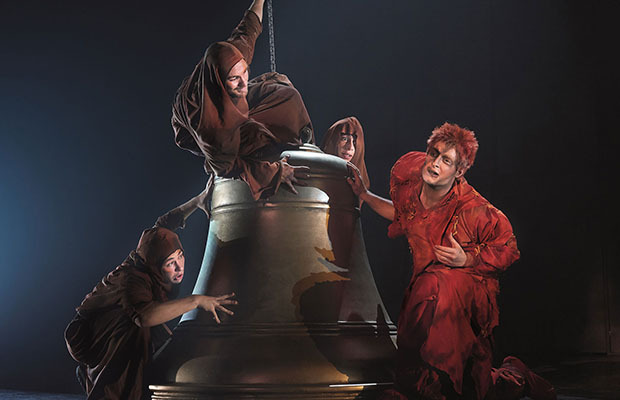 This sung-through musical is based on Victor Hugo’s classic novel of the same name (best known to us as The Hunchback of Notre Dame); the poet Gringoire takes us through the events surrounding the Feast of Fools in 1482, and the hunchback Quasimodo’s ill-fated love for the gypsy Esmeralda. She attracts more than just his attention, with Archdeacon Frollo and engaged soldier Phoebus both setting their sights on her – despite an initially frosty encounter, it seems that the dashing Captain of the Royal Archers is the one who will win the day. Alongside this, unrest is being whipped up by the authorities as they try to stop the numbers of immigrants and asylum seekers from rising, leading to numbers swelling in the ‘Court of Miracles’ just outside the city walls. It’s interesting to see how strongly the plight of the 'sans-papiers' comes through alongside the well-known love story, particularly as the show was adapted over two decades ago and hasn’t changed significantly in all that time. Across the world the issue of immigration has become a rather hot topic, but I’d argue that there are very few places where it is more keenly felt than here in the UK; it is as pertinent a time as ever for this kind of thing to be depicted on stage, especially somewhere in such close proximity to 10 Downing Street and the Houses of Parliament. This growing community is brought vividly to life by a large ensemble of dancers and acrobats, who fill the stage with an incredible energy – a little too frenetic at times, through you can’t fault their enthusiasm and stamina. Martino Müller’s choreography is a little samey at times, but is not without its memorable moments: the acrobatics in ‘Les Cloches’ show great imagination and is a true marvel. The visual side is a bit let down by an over simplistic set design (Christian Rätz) which isn’t always informative of where the action is taking place. Some projected backdrops in the style of American in Paris would work wonders in this respect, as it would add some context to some scenes and still be practical enough to enable the show to tour easily. This has heightened importance in a foreign language production, as it can help reduce any reliance on reading the surtitles – these are placed quite high, by necessity, so I’d recommend sitting in the dress circle (or above) if you think you may need to refer to them regularly. Most of it is actually fairly straightforward to follow with a basic knowledge of the story and/or French. Gilles Maheu’s direction could be a little more dynamic in places, to help explain the story and drive it forwards, as well as stop it from straying into concert territory – there are some very static scenes, and the large performance space can overwhelm the more intimate moments. As you might expect in a show of this nature, there is a rather hefty song list, but there are some really catchy tunes and showstopping numbers nestled in there; ‘La cour des miracles’, ‘La fête des fous’ and ‘Le temps des cathédrales’ are definite highlights, as is Esmeralda’s touching ‘Vivre’ and Quasimodo’s mournful ‘Danse mon Esmeralda’. Combining the original pop- and rock-inspired backing with part of the English National Opera’s string section (orchestrated and conducted by Matthew Brind) adds a certain je ne sais quoi to proceedings, and makes for a rather unique version of the show. Hiba Tawaji definitely stands out with her portrayal of the independent yet naïve Esmeralda – her sublime vocals were absolutely made to fill this large and historic theatre. Angelo Del Vecchio brings a surprising rock edge to the maligned Quasimodo and cuts a rather more sympathetic figure than the character does in the novel. The show is in capable hands with Richard Charest at the helm as sometime narrator figure Gringoire: he has totted up over 1,000 performances, and his ease with the material and enthusiasm for the story is clear for all to see. Notre Dame de Paris may not be a perfect show, but there is lots to enjoy, nonetheless. Its moments of spectacle are truly breath-taking, and its Europop-opera style does mean it stands out from the crowd – an intriguing insight into French musical theatre and ultimately a rather enjoyable night out.